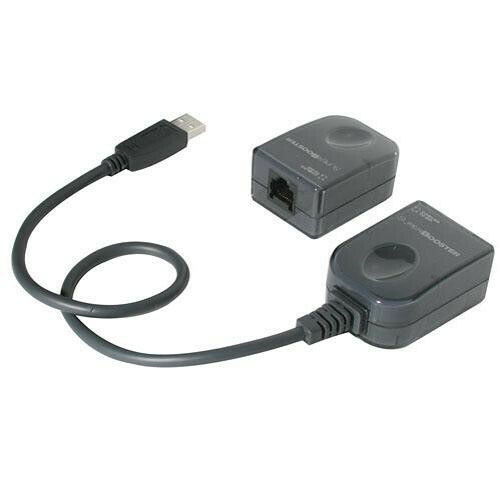 The USB Superbooster Extender from CablesToGo is a transmitter and receiver set that can boost USB data signals. The system allows you to transmit USB data over Cat5 Ethernet cable, over distances of up to 150'. Box Dimensions (LxWxH) 8.5 x 6.0 x 2.0"
USB Superbooster Extender is rated 4.1 out of 5 by 21. Rated 4 out of 5 by Ric the instructor from Superbooster works Great! I use this product in a teaching setting to allow me to interface with the engine and bring the data into the classroom. Everything works great, I only need 75 feet of cable so the cable is too long and is a lot to handle. Otherwise a great product. Rated 1 out of 5 by Matt in the Hat from Flakey at Best Flakey, intermittent. The pins get stuck down and have to be popped back into there slots on the RJ45 connectors. Do not buy this unless you like loosing connection to your computer. Rated 4 out of 5 by none from Good product. I have used it on computer and tv connections. It works on the newer tv sets alot better. I have mostly older tv. Rated 5 out of 5 by joeboo from The USB Superbooster is a cut above We tried another brand (slightly lowered price), but it did not perform. After searching for solutions we noticed that most products ONLY recommend this USB extender for use with their product. So we ordered it - BANG! Worked perfectly right away. Since then we have not wasted our time with any other brands. This one is flawless. Thanks! Rated 4 out of 5 by DWS from Simple means to extend mouse or keyboard We recently use this item to extend a computer mouse and/or keyboard 50 feet in a number of tough enviroments. Simple to use. Recommend use with a snagless ethernet cable. The units performed well. Plug and play. No issues. Rated 1 out of 5 by GT from USB 1.1 Superbooster Extender, too slow Used to connect a web cam mounted on the top of a wall mounted 60" LCD monitor used for video conferencing. The web cam is connected to the Conf Room computer, accross the conference room, via a CAT5 cable in wall. The video quality was poor due to the slow speed of this device, USB version 1.1. A similar USB via CAT5 extender (USB 2.0) was swapped with this one and the video quality improved dramatically. Rated 5 out of 5 by kstechtom from Worked great for video Worked Great for intra-oral camera (dental) fast, easy set-up. PC loaded camera without any problems. Good live video, freeze and save buttons work also.